Come and join us at the Wales Airshow for your chance to WIN A WEEKEND! We will be giving away an overnight stay at Morgans Hotel, cinema tickets along with some restaurant and shopping vouchers too! To be in with a chance, all you have to do is find us at the airshow and enter your details into our ipad and/or post a selfie using #BigHeartSelfie on Instagram, Twitter or Facebook! It’s as simple as that! Keep an eye on our Facebook page as we’ll provide more details on the day of where to find us – don’t worry we won’t be hiding! If you’re coming to the airshow, don’t forget to speak with us about our Indie500 Shop Local, Win Local campaign where you could win a £500 shopping spree by simply supporting our Independent businesses in Swansea City Centre! 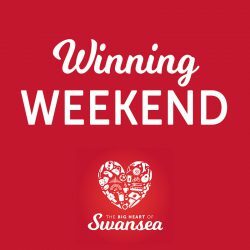 There are 2 ways to enter the competition, at the Big Heart of Swansea stand at the Wales Airshow or online using the link provided above. Entrants must provide a correct email address as this will be used to contact the winner and arrange collection of prize. Failure to provide the correct email address may result in the entry being withdrawn from the giveaway. For those entering with a selfie via Instagram, Facebook or Twitter, the photo uploaded must be posted publicly using #BigHeartSelfie in order for The Big Heart to find it. Overnight stay at Morgans Hotel: Winner will receive a voucher of £125 to spend on accommodation. Voucher can only be redeemed on accommodation and must be redeemed before 30th November. Dates are subject to availability and excludes bank holidays. £50 to spend in a Swansea City Centre Restaurant of your choice!